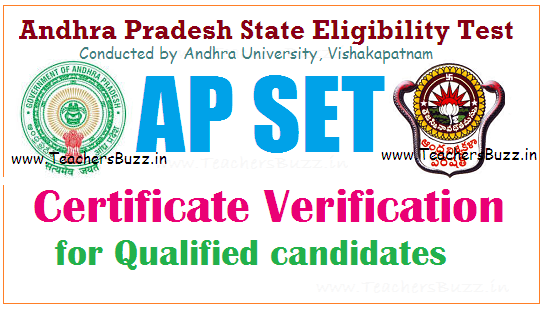 APSET 2018 Certificate verification Dates for qualified candidates | AP State Eligibility Test @ apset.net.in AP SET-2018 -Andhra Pradesh State Eligibility Test was organized on 1st July 2018. The examination would be held at 6 regional centers of the Andhra Pradesh state by Andhra University, Visakhapatnam. After the examination, all the applicants are searching for their APSET Lecturer/ Assistant Professor Result 2018 released at the official website given below. APSET Results and Certificate verification Dates of Archaeology, Anthropology, Chemical Sciences, Commerce , Computer Science & Application, Economics, Education, English, Earth, Atomspheric, Ocean & Planetary Science, Environmental Science, Geography, Hindi, History, Journalism and Mass Communications, Law, Linguistics, Life Sciences, Library and information Science, Management, Mathematical Sciences, Philosophy, Physical Sciences, Physical Education, Political Science, Psychology, Public Administration, Sanskrit, Sociology, Social Work, Telugu, Urdu subjects answer key and results are available here. The AP State Eligibility Test(APSET) notification has been released by AU. AP SET 2018 for recruitment as Assistant Professors or Lecturer in various University / Degree Colleges/ Institutions of Higher Education in Andhra Pradesh. SET is mandatory for lectureship in colleges and universities in the state. Those who have qualified in the National Eligibility Test(NET) conducted by UGC need not take it. Both government and private institutions consider the SET score while recruiting faculty. For all PWD candidates of all subjects, the certificate verification will be done only on 29-09-2018 and they have to report by 10.00 a.m.
14 Journalism And Mass Comm. 18 Library And Information Sci. All PWD candidates of all Subjects should report at 10.00 a.m. The following original certificates are to be produced for certificate verification. 5. Physically Handicapped Certificate (for PwD Candidates only). 7. One Passport Size Photograph. 8. A set of all above certificate photostat copies.